Monty and Julie Carlson share a love of the outdoors and gardening, descended from families who's love of growing things originated in the farms, forests and mountains of Sweden and Norway. The Carlsons carry on the tradition of these "roots", both having the benefit of learning about gardening from various family members passionate about growing. Monty's infatuation with the genus Hosta began over 20 years ago while in the nursery business. 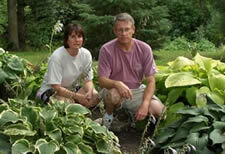 He started hybridizing 10 years ago, and then introduced Julie to hybridizing in 2003. We enjoy the continual learning curve involved with hybridizing, and have benefited from the knowledge, exchange of ideas, and shared passion of hostas and hybridizing with our fellow FOoSF members, along with countless hosta fans we've met along the way, and are looking forward to meeting many more in the future.